The two things I love most in this world are fast, reliable deliveries and the bops. When Taylor Swift announced her fifth album, Reputation, UPS also rolled out a fleet of #TaylorSwiftDelivery trucks with her face slapped on the side. Finally, a brand mashup that panders to my highly specific demands! A few weeks later, taylorswift.com quietly released a limited-edition UPS Commemorative CD Bundle on presale. 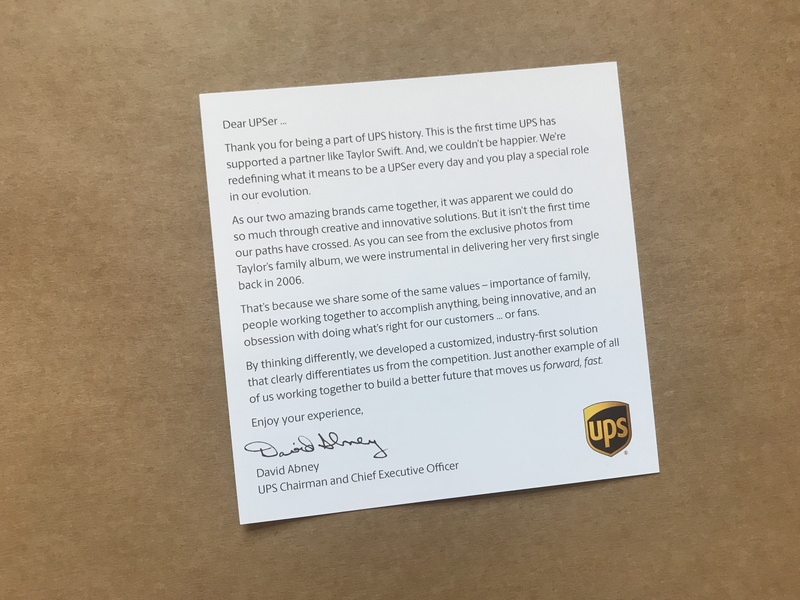 For $14.95 plus $9.50 UPS shipping, I could enjoy “the perfect gift for any UPSer, UPS family member, and Taylor Swift fan.” I trusted my UPS Commemorative CD Bundle would arrive on November 10 at the same super-speed her lawyers could send a cease-and-desist letter to my personal blog. To be clear, this is not a review of Reputation. This is a review of the six pieces of Taylor/UPS memorabilia that came in the UPS Commemorative CD Bundle. Shaped like the iconic Taylor UPS truck, this box is just the right size to hold a single folded dish towel. 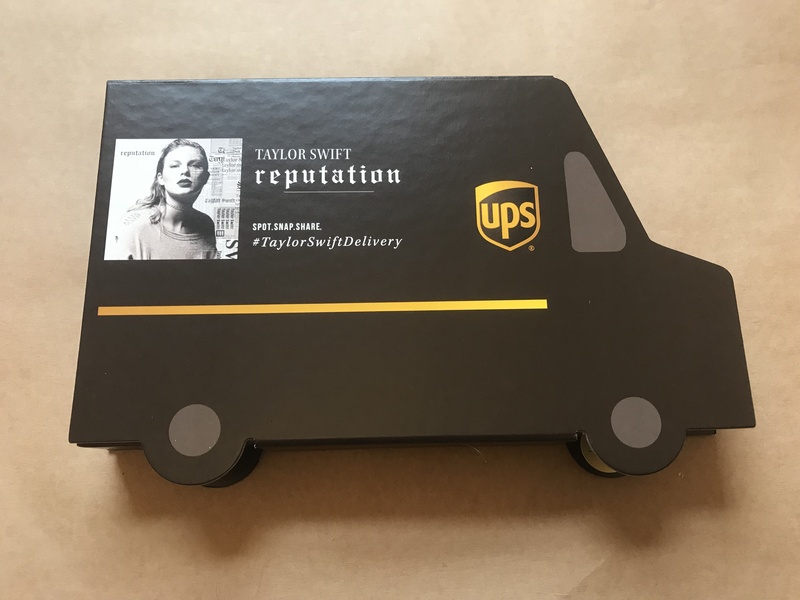 The lid has a magnet to hold it closed, which is the exact attention to detail I expect from both the Swift and UPS brands. 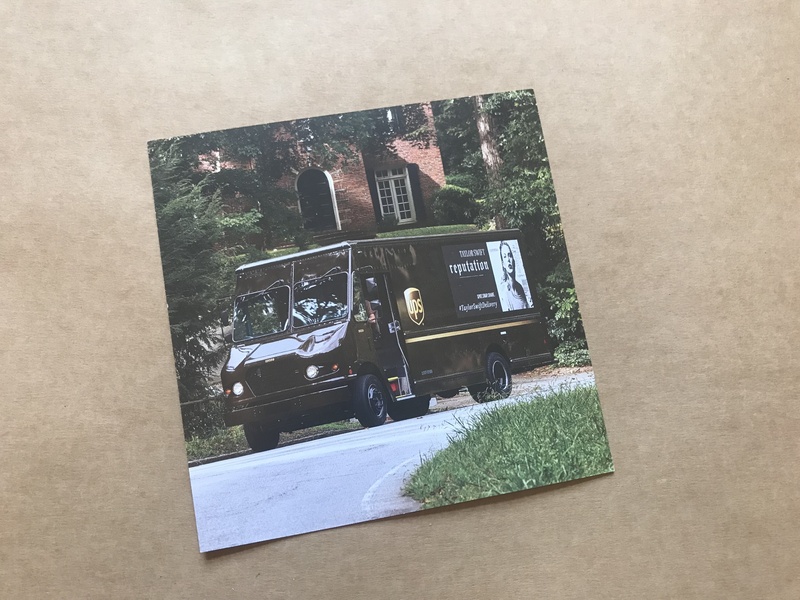 One of the wheels has a gold Limited Edition sticker that says “Set #17600.” Does this mean 17,599 people ordered the UPS Commemorative CD Bundle before me? I love my UPS family. Turns out the “historic photos” are just a single collage of 16-year-old Taylor unboxing her first single, “Tim McGraw.” Guess who delivered the boxes in 2006. In photos straight from the Swift family album, Taylor dresses like the sweetheart of the county fair in a paisley miniskirt and a UPS-brown t-shirt. Who could predict that one day, through dark magic, she would become a UPS truck herself. 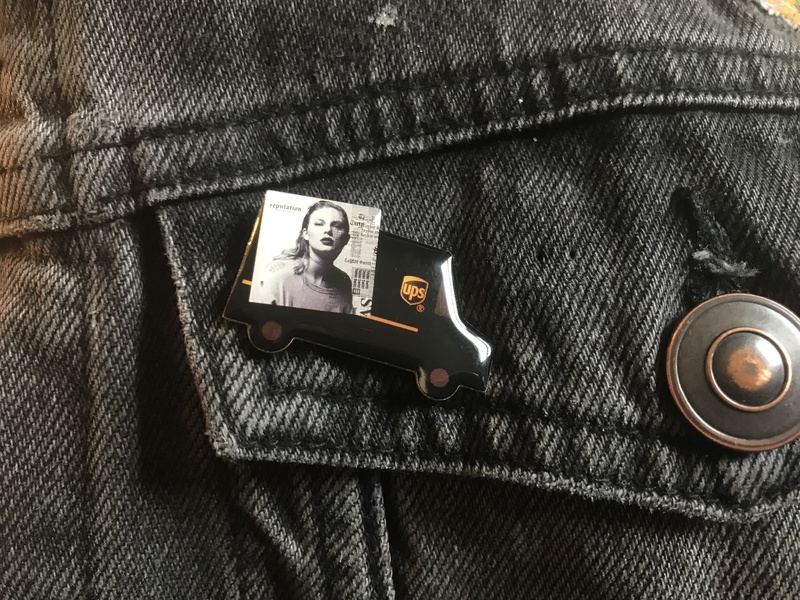 I’ve been hunting for the right addition to my jacket to make my haters say, “Pin game too Swift.” This enamel pin captures the clunky brown bulk of a UPS truck, with the Reputation cover too small to really scrutinize. Nothing elevates your lapel quite like pop music/parcel service synergy. I look forward to over-explaining this accessory for years to come. The letter begins with “Dear UPSer,” which is not a way I’ve ever been addressed, but sure. UPS Chairman and Chief Executive Officer David Abney begins by thanking me for being part of UPS history. You’re welcome, David! He then explains that UPS and Taylor share values like “family” and “innovation.” If we go by the themes of the album, we can also assume they share a love of petty drama and relentless revenge-seeking.